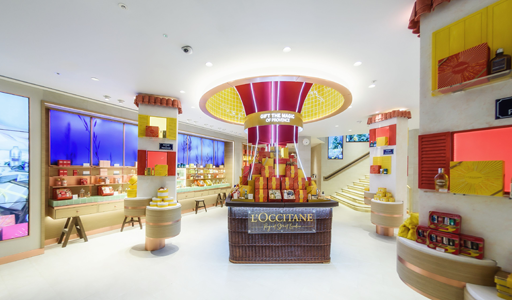 Twenty years after opening its first boutique on London's Regent Street, French fragrance and beauty brand L'Occitane has returned to opened its first UK flagship and its largest ever store. The two-story 6,450sq ft space at 74-76 Regent Street is in a Grade II listed building, famously designed by architect John Nash. The ground floor is home to L'Occitane's Scented Garden where customers can explore each of the brand's scents, all of which are based on ingredients from Provence. A Pierre Hermé macaron bar can also be found there that offers a selection of different flavours including three new combinations especially for the store: Jasmine, Immortelle and Neroli, Mandarin and Honey and Rhubard, Grapefruit, Nutmeg and Clove. The new store offers a Gifting Workshop too, featuring custom-printed and colour-picked ribbon, wax seals and fresh botanicals. A Customisation Cabinet also offers product engraving on over 20 products including favourites such as Divine Cream and Divine Oil. On the first floor, customers can get away from the hustle and bustle of Regent Street in the comfort of the L'Occitane Lounge which serves tea, coffee, cakes and macarons. There is also a Beauty Discovery Bar where Express Skincare Rituals (performed by an experienced L'Occitane Artisan) are available.